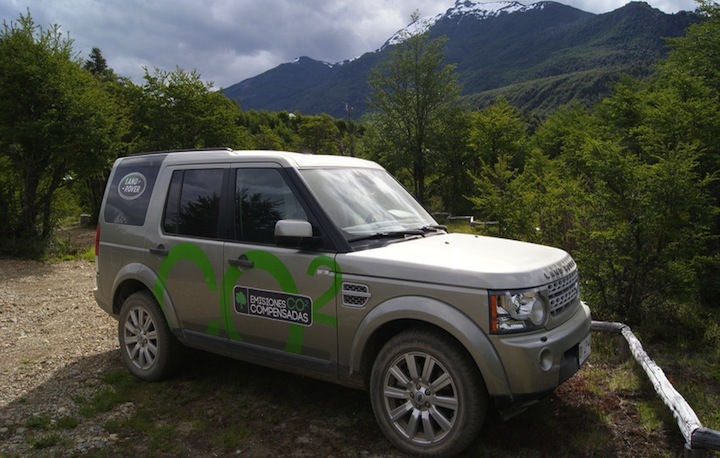 Patagonia Sur’s Carbon Offsets partnership with Land Rover Chile is highlighted in Capital‘s January 25, 2013 online article, “Autos que plantan árboles” (“Cars That Plant Trees”). It’s not new to talk about groups that work for the environment and the preservation of species. But it is worthy to mention that the young people of Patagonia Sur convinced brands like Land Rover to join its reforestation crusade. Already 13,700 carbon credits have been transformed into trunks and green leaves. It all began in 2011. In June of that year, Land Rover set as an objective to contribute to the reconstruction of Patagonia through an innovative initiative in the automotive industry, which sought to compensate the CO2 emissions generated by the first 20,000 kilometers of use in all 2011 models marketed in Chile. The idea is called the Reforestation Project, and it is led by the company Patagonia Sur. Since then, the brand has planted more than 13,700 native-species trees of lenga, coigüe, and ñirre (species of Southern beech) in Valle California, native forest inserted in the extreme south of our country, specifically in Palena, located in the X/10th region. Seeking to be on the environmental forefront, Land Rover strengthened this commitment and wanted to bring Capital to see – on site – exactly how it works. The project is based on offsetting the CO2 emissions of their cars by purchasing carbon credits, which translate into the planting of native-species trees. How is it calculated? The carbon dioxide emissions that each automobile emits in a year, or in 20,000 kilometers, is balanced by the trees required to offset those emissions. A carbon credit represents the compensation of one ton of CO2 already emitted. For example, a Land Rover Discovery 4.3 diesel emits 4.8 tons of CO2 in a year; these emissions are compensated by the planting of fourteen native trees. The car’s owner — in addition to having their first 20,000 kilometers of car usage offset — also receives a carbon offset certificate with a code and unique coordinates allowing them to view via Google Earth the exact location of where the trees corresponding to their purchase are planted. This automotive brand’s promise is to also extend this philosophy to all areas where they interact with their customers, for example, by offsetting 100% of their off-road events. “For us, it’s also important that the resources remain in our country, and to work with a local project. To this end, we wanted to support the plan for reforestation in Chilean Patagonia, which is lead by the company Patagonia Sur. Not only are we supporting the environment, but also the community, with a project that also translates into more jobs and education,” says Espinoza. The challenge for 2013 is not insignificant: to reach 24,000 native-species trees planted, and to ensure that their customers will join this initiative on their own accord.